F-15A: Single-seat all-weather air-superiority fighter version. F-15B: Two-seat training version, formerly designated TF-15A. F-15C: Improved single-seat all-weather air-superiority fighter version. F-15J: Single-seat all-weather air-superiority fighter version for the Japanese Air Self Defence Force. Built under licence in Japan by Mitsubishi. F-15DJ: Two-seat training version for the Japanese Air Self Defence Force. Built under licence in Japan by Mitsubishi. F-15E Strike Eagle: Two-seat all-weather long-range strike and ground-attack aircraft for the US Air Force. F-15I Ra'am (Thunder): Advanced version of the F-15E Strike Eagle for the Israeli Air Force. F-15K Slam Eagle: Advanced version of the F-15E Strike Eagle for the Republic of Korea Air Force. F-15S: Export version of the F-15E Strike Eagle for the Royal Saudi Air Force. F-15SG: Advanced version of the F-15E Strike Eagle for the Republic of Singapore Air Force. F-15S/MTD: One TF-15A was converted into a short take-off and landing, maneuver technology demonstrator aircraft. 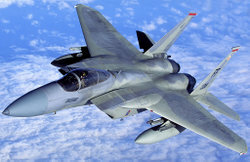 F-15 ACTIVE: One F-15S/MTD was converted into an advanced control technology research aircraft. F-15 IFCS: One F-15 ACTIVE was converted into an intelligent flight control systems research aircraft. F-15 Streak Eagle: One stripped and unpainted F-15A, demonstrated the fighter;s acceleration ; broke eight time-to-climb world records between Jan. 16 and Feb. 1, 1975.